The Albuquerque kid who became a world-renowned paleontologist and curator of the New Mexico Museum of Natural History and Science. When you meet Spencer Lucas, the words “world renowned” don’t come to mind. Lucas is the dinosaur guy who banters with morning DJs on 94 Rock. He teaches family science programs in the Sandia Mountains. His screensaver is a photo of his cat. And, by the way, he helped discover the oldest mammal known to science. The chief curator of paleontology and geology at the New Mexico Museum of Natural History and Science, Lucas’s influence is felt on much of what visitors experience at the museum that he joined in 1988, just two years after it opened. He curated all three of the museum’s dinosaur halls, recommending the fossils to be included and writing the explanations displayed with them. “Spencer is a world-renowned paleontologist bringing his expertise in paleontology and geology to our museum, but he’s also the person I can call on to give a public lecture at any time,” says Alicia Borrego Pierce, deputy director of the museum. A kid in 1960s Albuquerque, Lucas had to travel to New York City’s American Museum of Natural History to see dinosaur fossils collected in his home state. No museum existed here. That interest in history has guided Lucas throughout his academic studies and his scientific career. 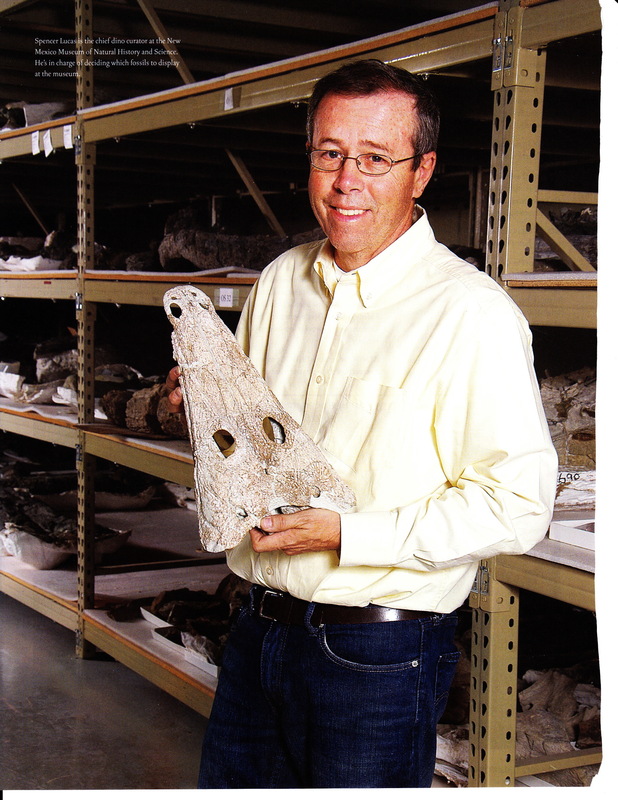 After Lucas graduated from the Albuquerque Academy in 1972 and from the University of New Mexico with a bachelor’s degree in anthropology in 1976, he journeyed to Yale University in Connecticut to pursue his interests in geology and paleontology. “When I went to graduate school and decided to get advanced degrees what was driving me more than anything else was curiosity,” he says. That curiosity lead him around the world as a doctoral candidate studying mammal evolution of 55 million years ago and still leads him into the field today. “It wasn’t enough to sit in Connecticut and read what Russian or Chinese paleontologists had written,” he says. “I wanted to go see the fossils, so I did.” He traveled to Europe, China and Russia to better understand the fossils, where they were coming from and what happened in the evolution of mammals at that time. Upon earning his doctorate in geology in 1984, he knew he wanted to return to the West but didn’t know if he could make it all the way home. He didn’t like living in the eastern United States — bad climate and too many trees, he says. A job soon presented itself in New Mexico to teach at UNM, and four years later joined the museum staff. “Getting a job here for me was quite fortunate,” he says. Quite fortunate for him, the museum and the state. Hunt says Lucas has published more on the geology of New Mexico than anyone ever before and has had a significant impact on the science of the state. Lucas has written everything from scientific papers and textbooks to easily-accessible guidebooks about the museum’s collection. Crossing the street from the museum exhibit hall and entering a cavernous store room lined with giant gray metal lockers and a glassed-in area filled with knobby plaster casts, Lucas leads visitors to his office. In a polo shirt and khakis he sits surrounded by files, colorful maps and charts, and books on geology, time and stratigraphy — the study of rock layers, his specialty. It’s something he applies to everything from fossils discovered and brought in to the museum by sharp-eyed kids to his own study of geological and paleontological questions. His current research and field work seeks to explain the relationship between the land and the sea that covered New Mexico 280 to 300 million years ago. He wants to know what was happening to life on land as the freezing and melting of vast ice sheets caused sea levels to fall and rise. After more than 10 years of study, he expects by the end of 2012 to to write an article providing a more comprehensive understanding than science had before. And about that oldest mammal known to science, a tiny skull the size of your fingernail and the single most important fossil he’s ever found. He and a couple of colleagues went to west Texas to see some crustacean fossils. Like a typical day in the field he carried a backpack, a rock hammer and a measuring stick. Noticing some small bones coming out of the rock, they decided to take some samples. “We didn’t even know what they were, we just put them in a bag and brought them back,” he says. A volunteer at the museum cleaning up the samples the bag noticed the back end of a skull in one piece of rock. Lucas took one look at it and could tell that it was a mammal skull, which proved to be from a tiny mammal that lived 225 million years ago. His switch from studying complex scientific problems in the field and writing about them to popularizing the science for the masses seems effortless as he moves about the duties of his day. “One of the nice things about being a paleontologist is that this is one of the most publicly-accessible sciences,” he says. “Kids learn about dinosaurs when they’re young and you as a person out observing the world can make discoveries.” That accessibility gives paleontology a public appeal above and beyond the inherent appeal of strange extinct animals and makes communicating it enjoyable, he says. “I’ve been on the show about a dozen times since, in part because T.J. was a ‘dinosaur buff’ who even went out into the field to collect with us a few times,” Lucas says. “Being on the show with T.J. was mentally tough — trading insults and other verbal shots with him for an hour or two tested my mettle. T.J. is a really smart guy with a fast tongue. Outside the bounds of science and the museum, he’s happy to spend time with his wife and his two cats. He’s a movie buff — his most recent discoveries: the Oscar-award-winning Iranian film “A Separation” and a renewed appreciation for Stanley Kubrick’s special effects in “2001: A Space Odyssey.” Still brimming with curiosity, he may turn his studies to botany one day. For now his work at the museum and in the field are rewarding enough.